I was stumbling around Spitalfield’s Market and was getting very hungry. I wasn’t sure I wanted to actually eat inside the market as it seemed noisy and separated from the sun. 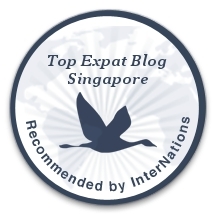 I exited the market and headed slightly northeast, combing the streets for interesting shops and affordable restaurants. 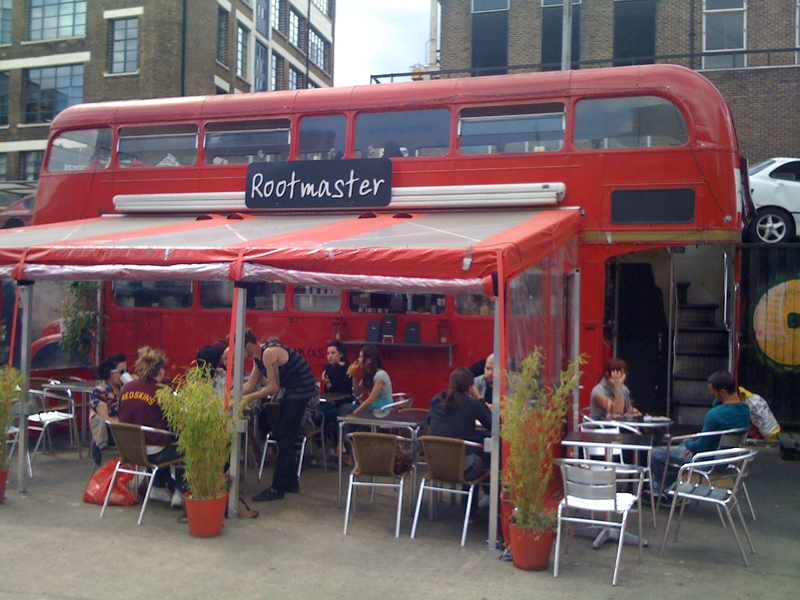 In my search I spied this double decker bus serving food with a sign that read “Rootmaster.” Back home, the funky converted buses, cargo containers and trailers converted into restaurants is the best place to experience street food ranging from simple to gourmet. Food trailers are found there grouped in parks together, alone, tucked away behind or in between bars and parks, and with their own movie theaters. It’s quite the scene. I was very excited because I hadn’t seen many of these type of things around London. I took a seat on the makeshift patio and had a look over the menu. Wow, what a great vegetarian friendly menu with gyozas, chickpea dishes, paninis, pastas and curries. I settled on a Rootmaster burger. 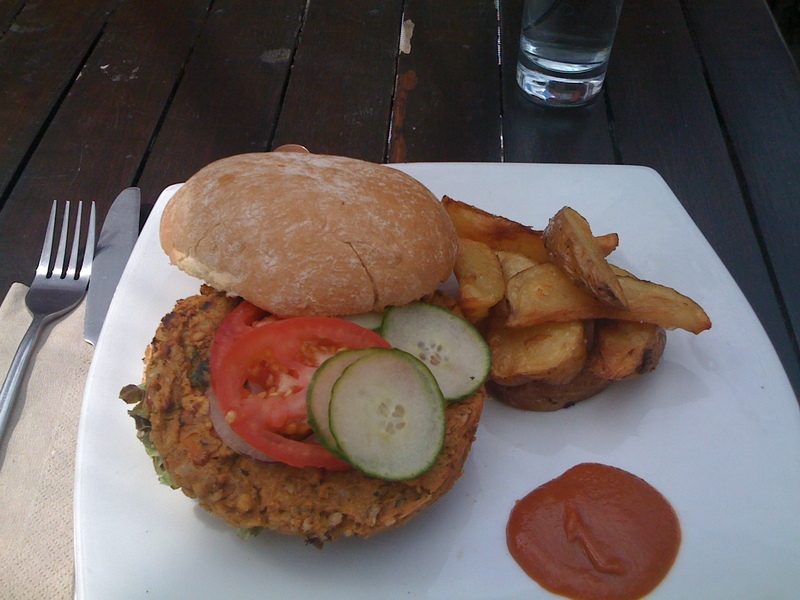 I typically avoid veggie burgers as they are often the cliche token vegetarian option. I had successfully avoided them for so long that one actually sounded appetizing! The Rootmaster burger was described as a flame grilled savoury bean burger served in a wholegrain bap (that means roll, y’all) with lettuce, tomato, bus made mayo & tomato sauce and served with organic potato wedges. “No, this is a vegan restaurant.” She looked at me sideways waiting for my reaction. “Score!” She smiled back with a slight bit of relief. That was random luck to stumble on a vegan restaurant in a double decker bus. I felt a little like I should have branched out and tried some of the other menu items as I saw wonderfully looking plates pass by me and make their way to other tables. I have had my bean burger for the year so I’m ready now to try other things. Boyfriend later explained to me that the name of the restaurant, Rootmaster, was a play on words. Routemaster is the type of double decker bus and was in production from 1958 until 1968. Root as opposed to Route is a nod to it’s vegan cuisine. Molly at the Particular Kitchen informed me of a similar Routemaster turned vegan restaurant in Soho. Vegan Routes is not affiliated with Rootmaster and is at the moment closed. Bottom Line: Yummy affordable vegan food in a funky converted double decker bus.